It’s been a bad week for Philip Dawdy, campaign director for Initiative 1068, a measure that would remove all penalties for adults possessing, transporting, growing or selling marijuana. He recently blew a tooth. He’s working 90-hour weeks, got one hour of sleep and is answering questions while lying on a couch because of back spasms. Worst of all, he’s recovering from the loss of a large, long-promised donation — one that would have allowed him to hire troupes of paid signature gatherers. A big donor, corralled by the Service Employees International Union, dropped out when he or she found out that the American Civil Liberties Union of Washington is not supporting I-1068, Dawdy says. The ACLU says the initiative lacks a regulatory scheme. Dawdy is angry. “The ACLU of Washington is an embarrassing organization,” he says. It’s not as if the initiative is unpopular. A May 25 University of Washington poll had 65 percent of Washingtonians supporting the initiative. But with three weeks left, supporters still had about 170,000 more signatures to collect. An initiative takes 241,000 validated signatures to get on the ballot, meaning organizers need to collect more like 300,000 in all. Using only volunteers, that’s quite a challenge. Still, I-1068 backers point to the precedent set by I-695, Tim Eyman’s famous $30 car-tab initiative, when an all-volunteer army blitzkrieged 250,000 signatures in the three final weeks before the 1999 deadline. The “raise taxes for the rich, lower ’em for the middle class” initiative has the two big things going for it: popularity and cash flow. There’s a lot I-1098 would do. It would levy an income tax against the wealthiest 3 percent of households, and use the extra cash to lower the state property tax, the Business and Occupation tax, and, theoretically, generate $1 billion to pay for health care and education in the state. The sales tax would remain untouched. Most of the pro-1098 advertising, however, talks about “tax cuts and job creation plus dedicated funding for quality education and health care.” Introducing a state income tax for the first time is saved for the fine print. The Washington Poll puts support for the idea at 58 percent, with only 30 percent opposing. Some big players have thrown cash the initiative’s way: Service Employees International Union branches have donated a total of $300,000, and the Bill and Melinda Gates Foundation has donated $50,000. 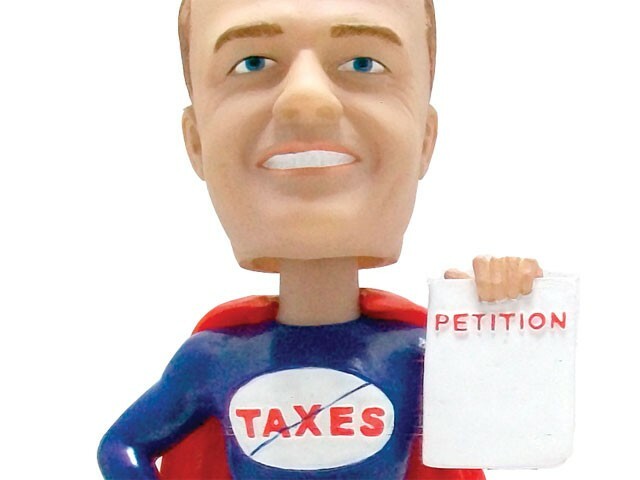 Tim Eyman’s Initiative 960 once required twothirds of the Legislature to vote for a tax increase in order for it to pass. But this year, the legislature suspended the measure. (Turns out they can do that.) Eyman’s new initiative — Initiative 1053 — would bring the two-thirds requirement back from the dead. Poll says 60 percent of voters support it, while only 24 percent oppose it. Costco wants to fight for the right to sell you liquor. That’s why they shelled out $350,000 to attempt to get Initiative 1100 on the ballot. Currently, only the state — and a few contracted stores — can sell liquor. Initiative 1100 would get the state out of the liquor-selling business, allowing any licensed alcohol retailer to sell it at whatever price they choose. Costco spokesman John Sullivan says it could mean cheaper liquor prices and, through taxation, more state revenue. But Brian Smith, spokesman for the Washington State Liquor Control Board, worries it could end up costing cities revenue. Profits from state liquor stores go to fund the State Liquor Control Board, and any additional revenue goes back to the cities and counties. Last year, the city of Spokane received about $2.4 million in revenue from liquor stores. I-1100 consultant Sharon Gilpin says they’ve already gathered enough signatures and are building on a larger cushion. The Washington Poll says 52 percent support it, while 37 percent oppose it. The beverage industry, however, has backed a competing initiative, I-1105, which would also privatize liquor sales, but would allow state price controls to remain. They’re late to the game, but they’re still a heavy hitter. The “Stop the Food and Beverage Tax Hikes” group wants to reverse those increases in pop, candy and bottled water taxes the Legislature passed to balance the budget. (Beer taxes would remain. )* But thanks to their late entry, with three weeks to go, they didn’t have a single petition signature. But unlike the legalize-marijuana folks, they’re brimming with enough cash to hire a horde of signature gatherers. Initiative 1107 has raised $1.26 million — double the amount of any other initiative group — thanks to the $1 million donation from the American Beverage Association. Of course the Washington Poll says that, by a narrow margin, more voters actually approved of those new taxes than disapproved. * An earlier version of this story incorrectly portrayed the scope of initiative 1107.